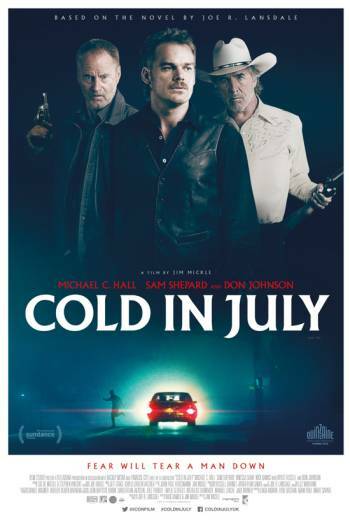 COLD IN JULY is a thriller about a man who is hailed as a hero after killing a home invader, but finds that his actions have become part of a mysterious conspiracy. There are shootings and throat-slashings which result in extensive bloodshed. There are also strong bloody images in the aftermath of violent incidents, as well as grisly images of a corpse. A scene shows a terrified woman being threatened with a baseball bat, but the ensuing assault is only implied. There are brief sexualised images, without strong detail, in a scene that depicts the shooting of a pornographic film.